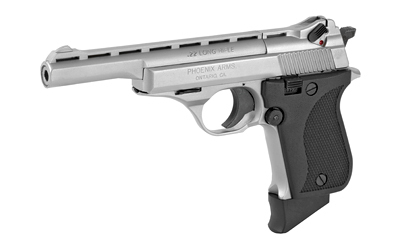 PHOENIX ARMS MODEL .22LR RANGEKIT FEATURES OUR HP22A WITH A 5-INCH VENTED RIB BARREL FOR INCREASED ACCURACY AND AN EXTENDED GRIP 10-ROUND STAGGER BOX MAGAZINE. 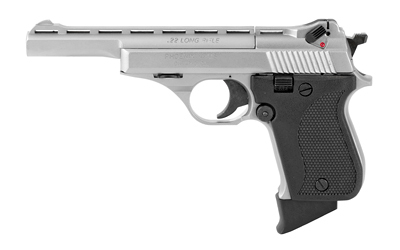 WEIGHING IN AT JUST OVER 23-OUNCES IN A SIZE 4.8 BY 7.5 INCHES WITH ALL OF THE FEATURES OF OUR STANDARD PISTOL. THIS HP22A COMES PACKED IN A CUSTOM FITTED LOCKING TRANSPORT CASE THAT IS COMPLETE WITH CLEANING KIT, GUN OIL AND INTEGRATED PISTOL LOCKING DEVICE. 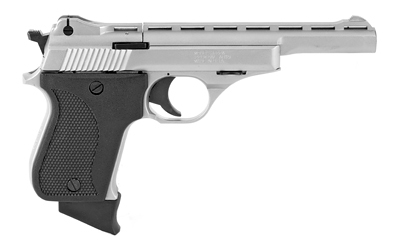 AVAILABLE IN SATIN NICKEL OR MATTE BLACK FINISH. DESIGN FOR STANDARD VELOCITY TARGET AMMUNITION. INCLUDES ONE 10-ROUND MAGAZINE.